Itau Unibanco has posted the highest-ever annual profits for a bank from Brazil. 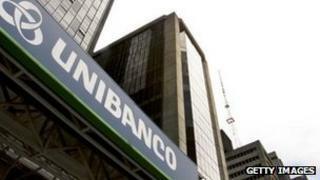 Itau Unibanco, the biggest private bank in Brazil, said net profits rose almost 10% to 14.6bn reais ($8.5bn, £5.3bn) in 2011 from the previous year. The bank is also the largest in Latin America and primarily exposed to its fast-growing countries. But the bank's profits fell annually in the last three months of the year, as Brazil's economy slowed. "In the domestic scenario, the trend towards slowdown in the economic activity was consolidated," the bank said. Brazil's official IBGE statistical bureau said in September that it expected 3.5% growth in 2011 - compared to 7.5% in 2010. In the last quarter of 2011, the bank registered net profits of 3.7bn reais, down 5.4% from the same period a year earlier. Brazil's central bank has had high interest rates for many years, encouraged by fears of a return to the runaway inflation that plagued the country in the 1980s and early 1990s. At the end of 2011, the benchmark central bank rate was 11%. Itau Unibanco has a market capitalisation of about $90bn - about 50% bigger than Goldman Sachs - and has a 25% share of the Brazilian market.